On May 24, we had the pleasure of announcing the creation of a solar park to help IAMAT advance its mission. The Foundation for the Support of International Medical Training (FSIMT), the entity governing IAMAT, owns a 105-acre property in Guelph, Ontario, Canada. The Foundation recently entered into a Lease arrangement with Hall’s Pond Solar Co-operative for the purpose of developing a solar photovoltaic park. 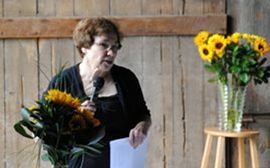 IAMAT’s President, Assunta Uffer-Marcolongo announcing the largest community financed urban solar park in Ontario. Example of solar panel modules. The Foundation’s Board of Directors believes that the solar park Lease is an excellent opportunity for IAMAT to advance its mission and grow its endowment fund for doctors and nurses from low resource countries to study and train in travel medicine. The solar park also honours IAMAT’s Founder, the late Dr. Vincenzo Marcolongo’s fondness for the property and his desire to protect its unique ecological and heritage features. The planned 7.5 megawatt ground-mounted installation will be located on part of the Foundation’s urban reserve lands. It will be the largest urban community financed solar project in the province of Ontario and an important contribution to the City of Guelph’s Community Energy Initiative. 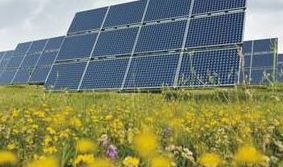 The solar park will be developed by Options for Green Energy, a division of Options for Homes, a non-profit corporation that assists in the development process. The project is supported by the Guelph’s Mayor, Karen Farbridge – who also presented at the press conference last week – and the Guelph Chamber of Commerce. We recognize the invaluable work of volunteer community members Bruce Bocking, Mike Fortin, Jaya James, Stan Kozak, Dan Pestill, and Jeremy Shute for their expertise and advice to the Foundation. Photos courtesy of Options for Homes.